Visas Avenue team is all geared up as they continue to acquire Visa approvals for their clients in the second quarter of this year. 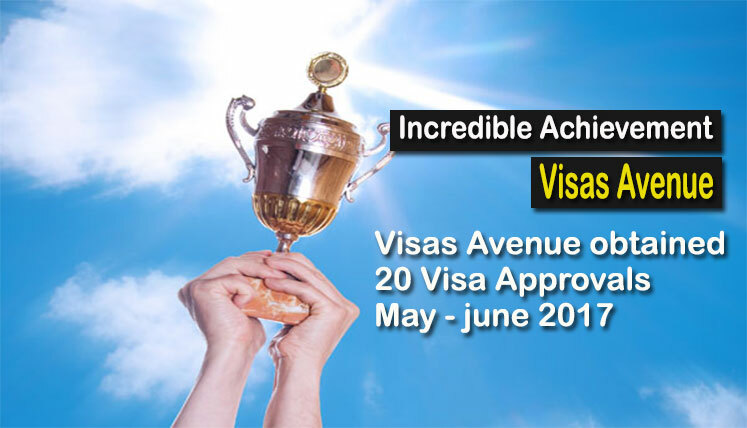 After the raining visa approvals in the beginning of the year, the efforts of Visas Avenue team are continue to bestow them the much-deserved reward, as we are half way this year. Visas Avenue has achieved about 20 Visa approvals for its clients within last two months, i.e. May & June 2017. Visas Avenue has acquired 20 Visa approvals within just two months for its clients under different visa categories. Its an incredible achievement and yet another feather in the cap of Visas Avenue team. The incredible success rate of Visas Avenue has been its USP over the years. Visas Avenue has proved it time and again, as to why they are considered as the top Visa and Immigration Consultancy Firm in India. Let’s take a look at the key visa approvals obtained by our clients within last couple of months. As they say, ‘success is journey and not destination’, Visas Avenue thoroughly understands the significance of making constant efforts, acquiring the knowledge, and putting in the best, while serving the clients. We at Visas Avenue believe that if we work dedicatedly setting the high client service standards for each individual in the team, the success will definitely follow us. And this is what we are doing over the years. Finally, if you seek any visa help, advice, assistance or support from us, you may send your queries and details to certified immigration experts at Visas Avenue on email id- info@visasavenue.com.